Loren Cunningham is the co-founder of the international Christian missionary organization, Youth With A Mission (YWAM) and the University of the Nations. In 1960, at the age of 24, he founded YWAM with his wife Darlene. YWAM has more than 20,000 full-time missionaries in 140 countries and 533 primary schools – many in the developing world. Loren has visited every country in the world. 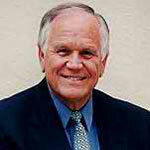 He is also the co-founder of the Global Accreditation Association, which accredits Christian schools around the world.